Posted on 30. May, 2010 by Corey in All, Dayton Dragons Baseball, General Baseball. 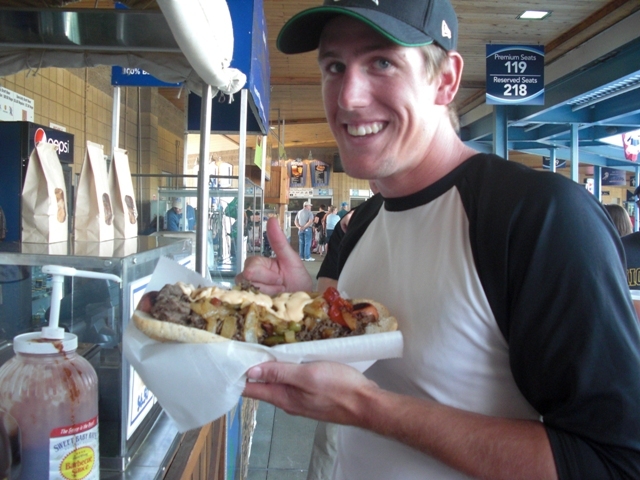 It has been said that the West Michigan Whitecaps like to “push the envelope” when it comes to food options at Fifth Third Ballpark, in Grand Rapids, Michigan. I have gone on record as saying I have not seen better overall food at a minor league ballpark in all of my visits throughout the years. 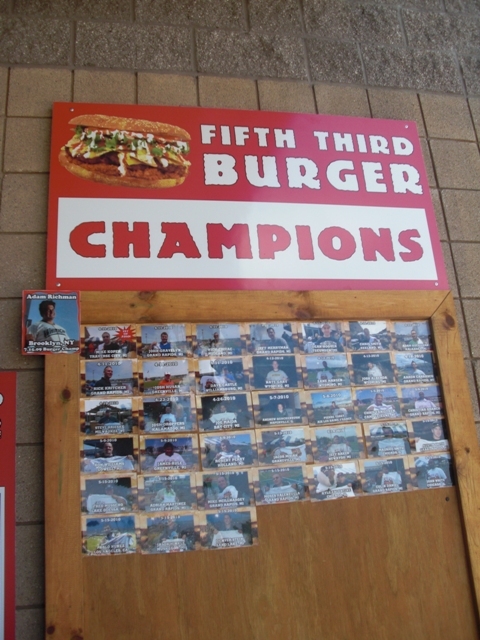 Last season, the team added a specialty item called “The Fifth Third Burger.” I HIGHLY recommend that you click HERE and read all about it. It is something that is one of its kind and worth a look. 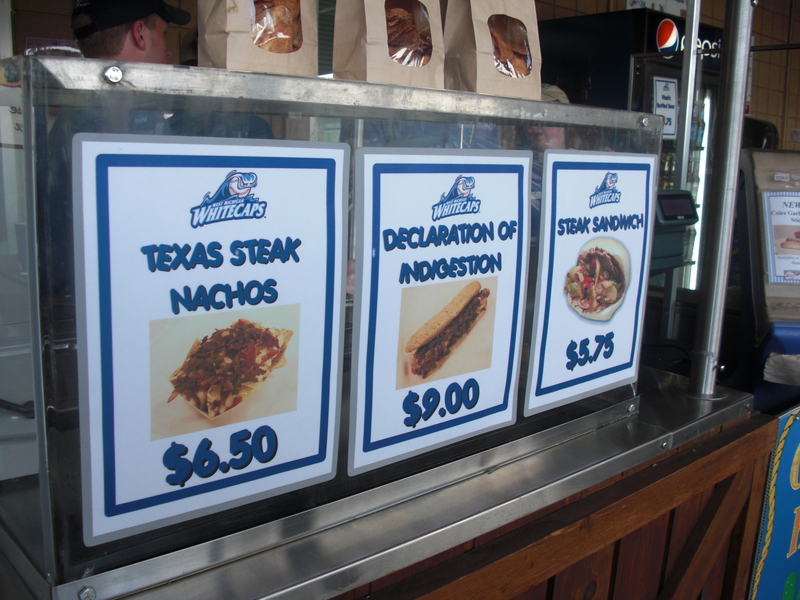 Before the 2010 season, the Whitecaps front office reached out to its fans to gather ideas about new menu items that they would like to see added to the park. The team was looking for something rare, but not to crazy that no one would eat it. They narrowed down the long list to 10 items, and had fans vote on what they thought. After nearly 25,000 were counted, two items were in a virtual tie, separated by a handful of votes. Instead of voting again, the team decided to add both items to the menu. The first item I have not tried, and to be honest, probably will not. It is called the Cudighi Yooper Sandwich and consists of a spicy sausage patty smothered in cheese, pizza sauce, peppers and onions. The price is only $5.75, far less than the Fifth Third Burger at $20 a piece. Also this item is not overly large and easily finish-able by anyone. 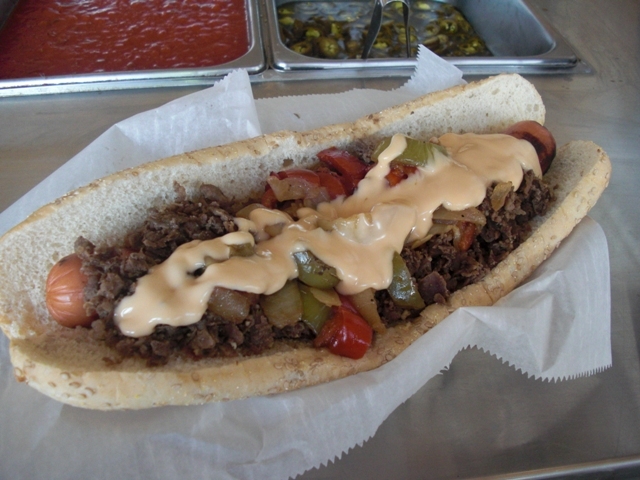 The other new item at Fifth Third Ballpark combines two stadium favorite, the hot dog and a Philly Cheese Steak. The item is a half pound, foot long hot dog covered in sliced steak, grilled peppers and onions, melted cheese and served on a giant sub roll. 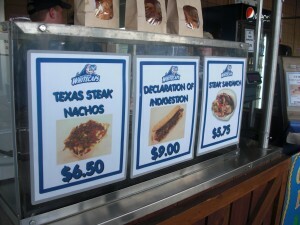 Priced at $9, this item has been named the Declaration of Indigestion. Very curious, I bought one to split with Ken Griffey, Tyler Steele and Andrew Walters. After eating a fourth of it each, we all commented that it was very good and tasty. It was a nice item combining two great food items. 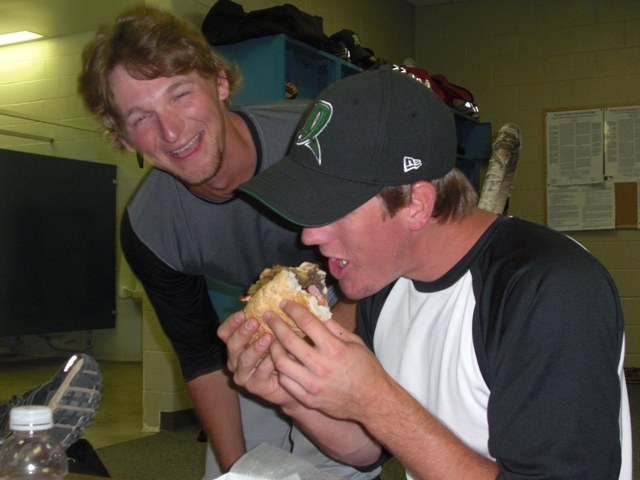 Dragons outfielder Josh Garton pounded a whole one by himself and came away very satisfied and very full. Again, please click HERE and read the article about the Fifth Third Burger. 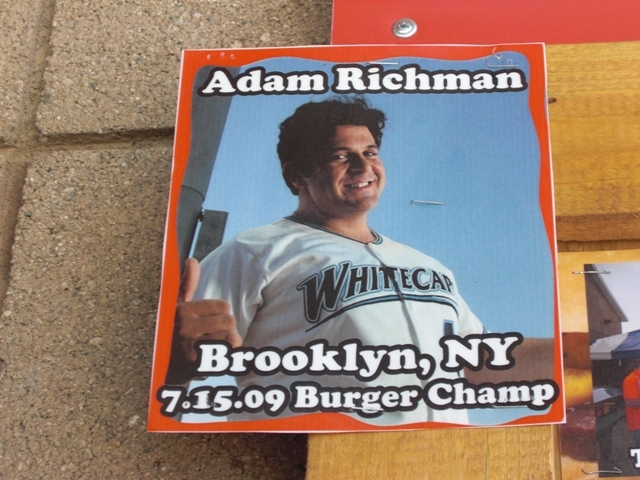 During the 2009 season, 1,939 burgers were served and only 298 were finished by individuals. The most famous to try the challenge, and complete it, was Adam Richman, host of Man v. Food. If you ever find yourself at a West Michigan Whitecaps game be sure to bring a very large appetite. when exactly do they serve the fifth third burger. I have no idea about baseball seasons. would I be able to get it all year round or just during baseball season?